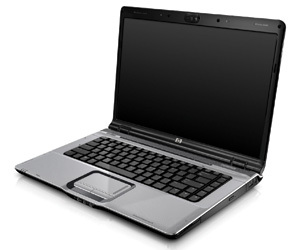 HP Pavilion dv6000t notebook PC or laptop computer is a versatile system that is configured to fit and meets most users’ computing and mobile entertainment needs. HP Pavilion dv6000t laptop features Intel Celeron, Core Solo, Core Duo (32-bit) or Core 2 Duo (64-bit) processor with Intel Centrino Mobile Technology solution, and is built with HP new classy notebook design with glossy, black resin finish and wave pattern, plus latch-free closure. dv6000t also features, depending on configuration, simple volume and launch buttons by tapping or swiping finger across a strip on the keyboard, HP Imprint Finish, integrated TV tuner, 15.4″ 1280×800 WXGA BrightView widescreen LCD, 1.3 MP webcam, dual omni-directional microphones, Nvidia GeForce Go 7400 graphics card with 256MB TurboCache, integrated Altec-Lansing stereo speakers, HP QuickPlay 2.3 which allows to launch DVDs, music, and photos without starting the system together with remote store in ExpressCard slot, optional HP xb3000 Notebook Expansion Base, plus lots of connectivity options such as ExpressCard/54 slot, Gigabit ethernet, consumer IR, Bluetooth, 802.11b/g WLAN, USB2.0 and etc. NotebookReview reviews and tests HP Pavilion dv6000t, and concludes that the HP Pavilion dv6000t is a full-featured multimedia notebook with a highly appealing look. Like all notebook computers, it is an exercise in compromise. What sets it apart from other machines, however, and goes a long way to explaining its popularity, is its impressive blend of looks, performance, comfort and price. At current prices, the dv6000t offers a fine mix of components and performance in the $800 to $1200 range. On top of that, it looks good and provides an exceedingly comfortable computing experience. There are only three “cons.” Of these, one, the screen resolution, is really a matter of personal preference and won’t make any difference unless a high-resolution LCD is desired; another, the issue of fingerprints, is rather trivial and may actually inspire the owner to keep the notebook nice and clean; and the third problem may be the rather short battery life.